The decisions one has to make. . . for a picture. So… how do I even begin to tell the story behind this picture? Well, I think I’ll take the short route. 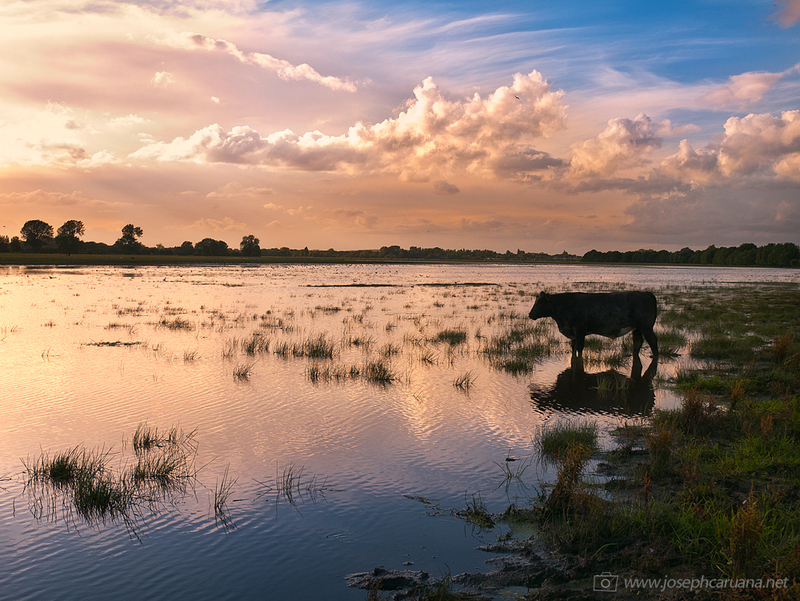 It was a nice afternoon, so I went out to Port meadow for a walk, camera in hand. The locals were around, happily mooing and chewing away. But then one of them strayed from the herd and went to drink from the pond. I ran as quickly as I could to approach the animal before it moved away. There was only one problem: I soon realized that between me and this one beast there was an extensive mound of, well… you know. So I had two options: (1) Take an unimpressive picture from where I stood, or (2) Hold my breath, look ahead and walk through. I chose the latter. It was only when I got halfway through that it became apparent that this not-so-nice pile of stuff was actually sitting right on top of a swamp; that’s also when a cloud of flies emerged out of nowhere. (Well, not nowhere, but you know what I mean.) I will assume it’s easy enough for you to stitch together the rest of the story. Ah well, at least I’ve got a picture I like.